Shtax - returning to Cloughanover tonight. Well known performer Aindrias de Staic bring his latest show "Seven Shades of Shtax" home to the Campbells Tavern, Cloughanover tonight December 28 for a night of comedy story-telling followed by a session onstage with the local Latchikos. It promises to be a fantastic evening with a few special guests and local homecomming apperanaces. Seven Shades is another comedy storytelling extravaganza by Aindrias de Staic. It details the plight of a man who simply can’t stop acting the bollox but he stresses it is not autobiographical! 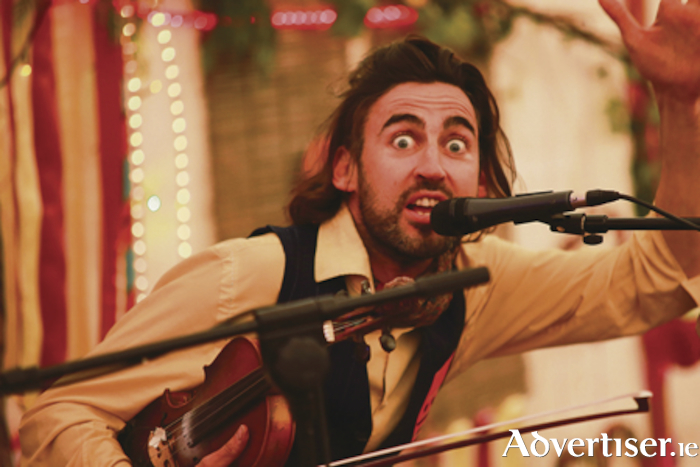 Armed with a fiddle, a loop peddle and some epic stories, de Staic returns to Cloughanover for more craic but this time he’s taking his Latchikos with him for a very special night in Campbell’s. Back by popular demand, after it's sell-out run in the International Bar as part of Dublin Fringe Festival, Seven Shades introduces de Staic’s alter ego- Shamadeus McDonagh— a good looking musician from the West of Ireland who has to go on a journey of self-discovery deep in the far east……. East Mayo that is, to address his deeply rooted character defects and learn what is really important to him. Direct from a sold out run at Dublin Fringe, and sold out Vodafone Comedy Carnival the show is on its way to Perth, Sydney and Melbourne next.